There’s nothing worse than sleeping on a lumpy mattress. But if the thought of forking out for a new one is the stuff of nightmares, why not compromise with a mattress topper? We’ve all done it – tossed and turned all night on a dodgy, substandard hotel mattress, dreaming wistfully of our marshmallow memory foam friend at home. That’s bad enough, but what about when you turn off the ten o’clock news at night knowing that waiting for you upstairs isn’t a luxury sleep world to induce the deepest of slumbers, but a devil-bed that digs its springs into your side whenever you dare to move? If this is you, it might be time to invest one of the best mattress toppers for a blissful night's sleep. A new mattress can be expensive – frightfully so – but for a fraction of the cost you can cleverly cover up the the horrors of your current conundrum with a layer that is as comfortable and as cushy as you like. 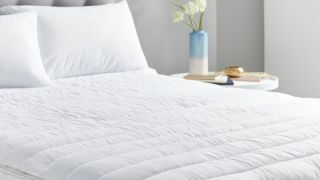 From squishy yet supportive memory foam mattress toppers to the pillowy-ness of goose feather top layers, each item on our list of best mattress toppers will open your eyes to the options out there. We’ll also give you the low-down (or the lie-down) on the type of mattress topper that is best for your sleeping position. From mattress toppers for back pain to the best mattress toppers for side sleepers, we’ll do our best to ensure that you discover the mattress of your dreams. If you're tired of your achy joints waking you up at night, the clever foam technology of the Eve mattress topper might just be able to help, as it works to even out the distribution of your weight as you doze, allowing for a more comfortable night’s sleep. As a pretty big bonus, the 3 cm of foam dulls movement, so if your partner tosses and turns all night, they’re less likely to wake you up. We know foam has a reputation for retaining heat, but don’t worry, because Eve have remedied this with a 2cm cooling layer. If you suffer from back pain and aching joints, the last thing you need is a bad mattress. This Silentnight mattress topper won’t fail to impress – quite literally, as you can feel your body sink into its softness as soon as your head touches the pillow. Because it’s made from ultra thick memory foam, it provides that necessary support at the same time, supplying you with the perfect conditions for a good night’s sleep. If you’re shuffling around on your mattress at night, never managing to find that one comfortable position, this cost-effective topper will help you on your way. It’s not one of the best mattress toppers for back pain, but due to quality memory foam and its innovative egg box design, if general comfort is what you require, you can’t go wrong. The profile cut, as they call it, also helps with air circulation, keeping you cool yet cosy. If you're hankering after that marshmallow feeling, the one where you fall into bed and you feel as though you’ve just landed in a world of pillowy softness, this mattress topper is the one for you. Unlike the others on our list, it isn’t made from memory foam, but that isn’t a negative at all. While it’s not something you would buy to relieve joint pain, the microfibre filling will provide you with an airy bounce for a weightless sleep. If you’re looking for a memory foam solution for your uncomfortable bed, this product could be your answer. While it may not do the job of relieving joint pain as well as the top brands further up the list, it does have pressure reducing properties, which will help you to achieve that deep slumber. It doesn’t have the same cooling technology either, so you may find that things get a little warm on summer nights, but for the price, you really can’t go wrong.